The "Reconfigurable Computing Environment" (RCE) , is a service-oriented software infrastructure for managing collaborative engineering processes. It hides the complexity of heterogeneous and distributed IT systems behind common user interfaces and thus enforces security in the access of data and services. RCE is easily adapted to different application domains: recent work has seen two German ship-building companies build the Ship Design and Simulation System (SESIS) on top of RCE. 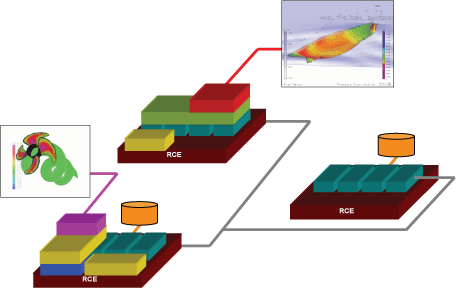 RCE was jointly developed by the Fraunhofer Institute for Algorithms and Scientific Computing (SCAI) in Sankt Augustin and the German Aerospace Center DLR in Cologne. RCE is an open infrastructure framework that offers all the services necessary to operate a distributed collaborative environment. The key features of RCE are its portability and extendability, its security services and that fact that it is application-independent. RCE is based on OSGi (Open Services Gateway initiative), the industry standard for modular dynamic Java applications. RCE is therefore platform-independent and can be used on any architecture from laptops to mainframes. RCE can be easily extended by application-specific plug-ins. Services are integrated as plug-ins, the central mechanism known from the Eclipse universe. Non-Java code such as C or Fortran decks can be integrated via wrapper technology, which has already been developed to integrate existing code. This approach allows existing software to be reused and thus earlier investments to be saved. Communication between the components is realised via a generic interface. There exist several implementations for data transfer, which are deployed depending on the distance between partners and their security needs. Remote Method Invocation (RMI) realises communication in the same compute node, CORBA (Common Object Request Broker Architecture) is used for intranet communication and Web services pass firewalls between company domains. Figure 1: Distributed RCE architecture. RCE has an integrated user rights management, which protects access to resources and services. The basic philosophy is that owners control the data or code owned by them, and must grant explicit permission in order for other users or user groups to gain access. This is essential in collaborative industrial environments, where intellectual property rights must be preserved. The seamless integration of Grid technology into RCE allows the transparent use of resources of service providers. Further, RCE enables engineers to access computational resources on demand, giving them the opportunity to submit computationally intensive simulations to high-performance clusters. Such clusters are usually not available in small and medium-sized companies, because the acquisition of such equipment is not profitable. In a collaborative network, RCE is deployed as a base system on each computational resource participating in the network. By adding individual plug-ins, each installation can be configured individually: database plug-ins integrate connections to file systems and databases, wrapper plug-ins connect the network to (commercial) simulation codes, and GUI plug-ins allow the engineers to view design data and display results graphically. Because of its open architecture, RCE can be applied to arbitrary application domains. Cooperation with two German shipyards (Flensburger Schiffbau Gesellschaft and Lindenau GmbH Schiffswerft und Maschinenfabrik) has seen RCE used to integrate consultants and suppliers into the ship design process. The Ship Design and Simulation System (SESIS) integrates the individual databases involved in the construction of a new ship. The service-oriented architecture allows transparent sharing of data and simulation facilities between the partners. Overall, SESIS significantly improves the design process for new ships, which must be constructed in a limited time and involve the expertise of a large number of partners. Figure 2: Left: RoRo ferries by Flensburger Schiffbau Gesellschaft; right: Double hull tanker by Lindenau Werft. DLR and Fraunhofer SCAI are planning to establish RCE as a service-oriented platform for future projects in other application areas. For example, the integration of engineering processes in automotive and aircraft industries is currently in preparation.